Being charitable is a style of living more than an act of giving. “If you are kind only to your friends, how are you different?” Matthew 5:46 MSG. Being concerned for yourself and those nearest you is a natural response. But that omits those who have real needs but for which you feel little practical responsibility. Feeling compassionately toward family and friends is natural. You know them and feel comfortable with them and you know that they also care about you and your needs. It is only natural that you care about theirs. But what about the needs of those you don’t know well or more likely do not know at all? Jesus challenged His followers this way, “If you love only those who love you, what reward is there in that? If you are kind only to your friends, how are you different from anyone else? But you are to be . . as your Father in Heaven is . .” Matthew 5:46-48. The needs of others, and their inadequacy to provide those, present a challenge in your lifestyle of charity and generosity. At certain times of year, there are many requests by community organizations, “to remember those less fortunate,” and thankfully there is usually a broad response to such appeals. But people’s needs are not limited only to such times. The transience of people and vast metropolitan areas complicate a previous generations’ social inclination for neighbors helping neighbors. Many families know their neighbors little more than anyone else. Sadly, we have become a community of strangers without the old fashioned sense of community. It is easy to feel overwhelmed by people’s needs, becoming paralyzed by helplessness when exposed to the vast scale and scope of world needs from social and global media. But God’s Word remains true. “How blessed is he who considers the helpless.” Psalm 41:1 NAS. I remember being told, “Do not despise the day of small beginnings.” Touching hearts and changing lives begins when even one heart acts compassionately. Consideration precedes compassion; compassion prompts contribution. There is a small rhyme that I learned many years ago that seems appropriate to my thoughts today; “I am only one, but I am one. I cannot do everything, but I can do something. And what I can do, I ought to do; and what I ought to do, by the grace of God I will do.” Being charitable is a style of living before it becomes an act of giving. Charity and generosity becomes a lifestyle. Consider 1 Corinthians 13:1-3 KJV. Living charitably is more than giving money. 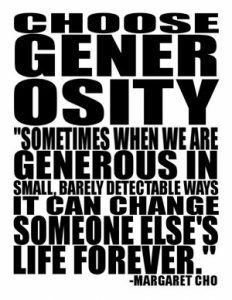 Generosity can be expressed by an encouraging word, a helping hand, a kind gesture, or a bit of time and companionship. Becoming generous with your time and self makes sacrificing more practical things happen more easily. “Christ sacrificed His life for us. This is why we ought to live sacrificially . . and not just be about ourselves. If you see some brother or sister in need and have the means to do something about it but turn a cold shoulder and do nothing, what happens to God’s love? It disappears and you made it disappear. Let’s not just talk about love; let’s practice real love.” Read 1 John 3:16-18 MSG. Charity and generosity really is about lifestyle, isn’t it? Today, I pray for you to make your lifestyle a little more like Jesus. 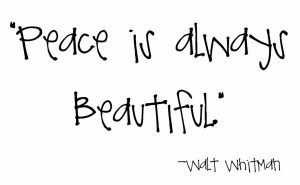 Peace is well worth pursuing. “Peacemakers who sow in peace raise a harvest of righteousness.” James 3:18 NIV. The value of peace is inestimable. “The peace of God, which transcends all understanding, will guard your hearts and your minds in Christ Jesus.” Philippians 4:16 NIV. Tranquility is too valuable to live without. Those who lack peace most know its irreplaceable value best. There is peace of mind. There can be peace with your past and about the future. There should be peace in your marriage, home, and relationships. There is peace with others. But peace with God is the most essential and most cherished. ”Now may the Lord of peace Himself give you peace at all times and in every way.” 2 Thessalonians 3:16 NIV. When peace with God is lacking, peace within yourself and with others is absent altogether, or at least diminished. Let’s look at peace with others. What you cannot do is guarantee that every difference with others can be resolved mutually. Jesus understood that people, far from perfect and living in a fallen world, will give and take offence. In a strained and problematic situation, you must accept that sometimes the best thing you can do is just to not add to the situation further. However, your part of the problem, whether small or large, must be settled righteously. First, resolve in your heart that you have done everything you know to do, and commit that you will do anything God asks you to do. The Bible’s wise counsel is: “If it is possible, as far as it depends on you, live at peace with everyone.” Romans 12:18 NIV. The steps for, “as far as it depends on you,” are fairly straight forward, but rarely pain free. Recognize how you have contributed to an offense. Ask God and the other party to forgive you. Make amends as they are needed. Forgive without waiting to be asked. Allow God time to work in hearts – yours and theirs – for restoration of the relationship as time and grace will allow. Regrettably, we all contribute to a few of such circumstances. At times, you may have little inclination to either give or seek forgiveness. Unforgiveness and resentment will only bear bitter fruit in your heart and painful relationships in your life. When you feel hurt, accepting God’s terms for healing might take time and prayer, but will certainly require humility. Sometimes you will want to, “fix it,” but often cannot. As God works grace and forgiveness within you, allow God to work in other hearts as well, in His time and theirs. Be wary of storing hurtful memories when feeling wronged or misunderstood. “Make every effort to live in peace with all men and to be holy.” Hebrews 12:14 NIV. I think the simplest understanding of Jesus’ teaching is this: whenever and wherever your desire for peace is refused, don’t leave with less than the peace and blessing with which you came nor carry their spiritual and emotional baggage as you leave. Read Matthew 10:12-14 NKJV. Peaceably, go your way with only good will. “Whoever would love life and see good days must keep his tongue from evil and his lips from deceitful speech. He must turn from evil and do good; he must seek peace and pursue it.” 1 Peter 3:10-11 NIV. Peace is well worth pursuing. “Peacemakers who sow in peace raise a harvest of righteousness.” James 3:18 NIV. Today, I pray for you to value God’s sufficiency of grace when received or extended. 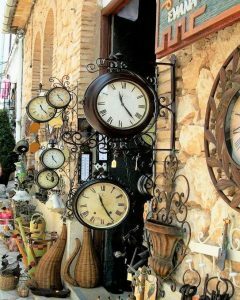 Our clocks do not often match God’s calendar. “No good thing will He withhold from those who walk uprightly.” Psalm 84:11 NKJV. I think anyone who knows God fully believes this truth: “No good thing will God withhold from those who walk uprightly.” A loving and giving God would not choose to withhold what is good. The problem lies in determining what is good for you. God promises to provide what He deems good for His purposes in your life and at the time He knows will be best. The most bountiful giving can never impoverish God. God is no poorer for however much He gives. With our limited resources, you and I might desire to give what another needs, yet lack the ability to do so, but that certainly is not true of God. God has desire, capacity, and ability to give. And His gifts will be, “good measure, pressed down, shaken together and running over.” Luke 6:38 NIV. Describing a child asking their father for good things, Jesus explained, “Which of you, if his son asks for bread, will he give him a stone? . . If you know how to give good gifts to your children, how much more will your Father in heaven give good gifts to those who ask Him.” Read Matthew 7:7-11 NIV. In Jesus examples, a son was asking what the father desired to give – good things. The Apostle Paul wrestled with that kind of physical and emotional pain from an undescribed, “thorn in the flesh,” and physically languished in a Roman prison, while what would appear to any of us as being “a good thing” seemed to be withheld. The answer Paul received is also God’s answer to you and me, “My grace is sufficient for you. My strength is made perfect in weakness.” See 2 Corinthians 12:8-10 NKJV. God’s abiding and abundant grace will be far better than momentary relief. Confidently, Paul wrote to the Philippian Christians, “My God shall supply all your need according to His riches in glory by Christ Jesus.” Philippians 4:19 NKJV. I want to live with undoubting confidence and tenacious faith. Here’s the challenge. When the real need of your moment remains unmet too long, you will wonder or ask why. The unwanted, unanswered question will press its way into your thoughts. Emotionally, there is a progression from wondering how your need will be met to worrying if and when the need will be met. Your heart knows God will provide, but you struggle when you don’t know when. Those questions are emotionally difficult when God appears to remain silent. There is only one answer for the times in life when all you know about God doesn’t match the reality you are presently experiencing. We measure life by moments, minutes, and hours; God measures our lives by eternity. That’s when you must look up into the face of a loving and gracious God and say with all your heart, “My times are in your hands!” Psalm 31:15 NIV. Know this; either God has something far better when you would settle for less right now, or your need is not what you really need at that moment. When you don’t know when, God does. He is always on time, never late. He is ever gracious and giving. Today, I pray for you to be sure your clock and God’s calendar agree. Extraordinary is all about who God is rather than who you are. “We are more than conquerors through Him Who loved us.” Romans 8:37 NIV. Whether it’s a sports competition or a friendly, family game at the kitchen table, it feels good to win. But winning does not seem to come so easily in the area that matters most, everyday life. The world, as the Bible describes this daily arena of the spiritual conflict of culture and values, can be a formidable adversary. But do not be anxious; victory is possible, even assured for the true child of God. John affirmed, “For everyone born of God overcomes the world. This is the victory that overcomes the world, even your faith. Who is it that overcomes the world? Only he who believes that Jesus is the Son of God.” 1 John 5:4-5 NIV. Obviously, it is very important that you establish that you are born of God, therefore empowered to overcome. “Loving God means keeping His commandments, and really, that isn’t difficult.” 1 John 5:3 NLT. Conviction and obedience are the evidences of the person who is born of God. Jesus said this in the most plain and simple way, “If you love Me, you will obey what I command.” John 14:15 NIV. When just a teen, my heart was pierced by a question Jesus asked, “Why do you call Me, ‘Lord, Lord,’ and do not the things I say?” Luke 6:47 NIV. Jesus equates love with obedience. Aren’t we all capable of accurately acknowledging who God is, yet doing things inconsistent with our proclamation of faith? That inconsistency will allow the world to overcome you, rather than your overcoming the world. Ordinary is a good word to describe any of us, but not God; extraordinary describes and defines our God. Extraordinary is all about who He is, not who you are. See Ephesians 3:20-21 NKJV. The good news is this: the most ordinary person convinced of the authority and ability of their extraordinary God can successfully overcome a world system that would otherwise confront, confuse, and seduce them. We miss the point when we try to do extraordinary things when we just have to be ordinary people who allow God to be extraordinary in us. 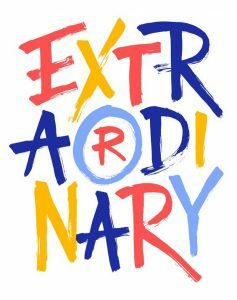 If ordinary is all that’s required, I would say that most of us are prime candidates to be extraordinary in Christ. Hebrews 11 is a litany of ordinary people accomplishing extraordinary things. See Philippians 2:13 NLT. Ordinary is not so bad when you believe extraordinary accomplishments are within the reach of your faith, a faith that is safe and secure in His love so that nothing can defeat you. Paul was certain, “In all these things we are more than conquerors through Him Who loved us.” See Romans 8:35-39 NIV. I am not sure what “more than a conqueror” is, but it is surely enough to make you victorious over all, and with some to spare. Now that’s extraordinary. Today, I pray for you to be confident that you and Jesus will always be more than enough. What you store in your heart is revealed in your words. 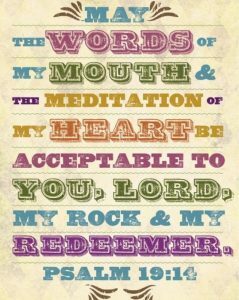 “May the words of my mouth . . be pleasing in your sight, O Lord.” Psalm 19:14 NIV. More than you might realize, words matter. They can matter a lot more than you might think, to the one that speaks them as well as the ones that hear them. Words are easily spoken, readily heard, and sometimes quickly forgotten, but not always. And it seems the words we tend to remember are often the words that would be better if forgotten. The good things a person hears seem too quickly lost amid the daily distractions of life while less wholesome words can lodge in one’s memory indefinitely. Choose wisely the words you speak. Ponder carefully your words before you speak; consider your own feelings if you heard them said about you instead of spoken by you. The Bible offers wise counsel, “Let your conversation be always full of grace, seasoned with salt, so that you may know how to answer everyone.” Colossians 4:6 NIV. Salt has two important properties: to preserve and enhance. Your words should do the same. Now let me change my attention to the important matter of self-talk. Words that you tell yourself also matter as much if not more than how you speak to others. As always, the Bible provides instruction; “Give ear to my words, O Lord, consider my meditation . . May the words of my mouth and the meditation of my heart be pleasing in your sight, O Lord.” Psalm 5:1 NKJV and Psalm 19:14 NIV. There is an inviolable connection between your public conversation and your private meditation. At a time when popular opinion was unfavorable and threatening, “David encouraged himself in the Lord.” 1 Samuel 30:6 KJV. Don’t rehearse your past or your problems; that’s just further discouraging. Remind yourself about God and His power and promises; that’s encouraging. Do you ever wonder what David said to himself that encouraged him? Did he recall the day on the battlefield when Goliath fell at his hand? Did he remind himself of the past faithfulness of God? Or the promises of God? Or the power of God? Or the history of God across his lifetime? Whatever he said and thought, he was encouraged in the Lord. I recently heard an interesting statement. “Don’t listen to yourself. Talk to yourself.” Let your self-talk be uplifting and inspiring. Never talk to yourself in a lesser way than you would speak to others. Don’t indulge negative thoughts about yourself or your circumstance. Be as wise in what you tell yourself as you should be careful in what you say to others. The meditation of your heart and mind should be purposeful, healing, and uplifting. “Be filled with the Spirit, speaking to one another in psalms and hymns and spiritual songs, singing and making melody in your heart to the Lord.” Ephesians 5:18-20 NKJV. What you store in your heart is revealed in your words. Today, I pray for you to be gracious in your words to and about others.